Welcome friends to my Favorite 5 for March! I got so caught up in a few of these things that they made it into other posts already and the others are likely to follow. I hope there is something in my pics that you find a fancy with for a Spring Fling! By the way, this is the Launch of The Party Bloggers first Link Party, so if you wish to join the party, follow the links below the post. The party will be open for 7 days. Party Etiquette and other party info is on my Party Bloggers Page. Hope you can join us! Happy Spring is all about Fragrance! As the snow melts away and we see the beauty of the crocus popping up through the earth we know that the fragrance of lilacs and lavender are not far behind. Because Spring represents a shedding of the old dead nature literally to new life in buds and blossoms, it is the perfect time to consider a new fragrance for ourselves. I am very picky about fragrances. I typically am more drawn to the men’s cologne counter than the ladies…maybe that is because men’s colonge should attract us? If so, they are hitting it out of the ballpark. 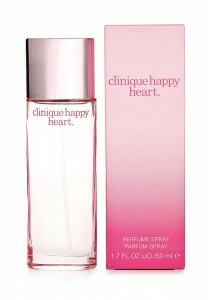 However, this Christmas my husband again had on his list Clinique’s Happy Cologne. So while I was at their counter making a purchase for him, I had some kind of rewards which allowed me to purchase something for free. I decided to try on some of the new to me Clinique Colognes for women. There were two that I had such a hard time deciding between that within a few weeks, well I had purchased them both. This has a very fresh scent, no woodsy or musk in it at all. Yet not “old lady floral”. I love the blend of the floral with the citrus and it pulls off it’s bold name…I have a happy heart when I spray this on myself as I prepare for my day. 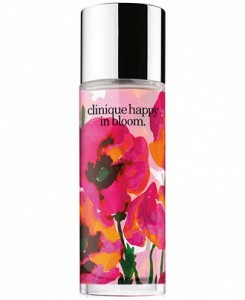 The second scent that I also purchased was Clinique’s Happy in Bloom perfume. At first I thought that Happy Heart was my favorite, but I truly can’t decide between the two of them. My daughter who is 32 years younger than me and in her mid 20s has also purchased this one, so it has a very broad appeal to women of different ages which has got to be a miraculous thing for them as a brand. Definitely a light floral scent. Here is the thing, if you think you like this…buy it now because it is only out for a limited time. I discovered Bare Minerals in my 40s when I finally decided to get a line of make up rather than just randomly choose a foundation, blush, shadow, etc. I faithfully used them into my 50s when some kind friends decided to warn me that powders on aging skin can make it look dryer and older. So I laid off and tried some other makeup brands recommended by my daughter, but again, our skins are ages apart and she is blessed with some of my husband’s skin traits giving her a more olive completion than my transparent. 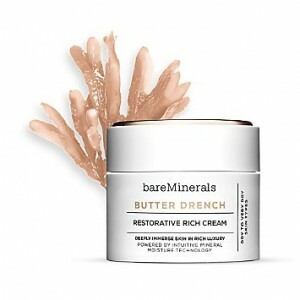 Recently Bare Minerals have been adding some liquid options and even more recently added a new line of skin care. 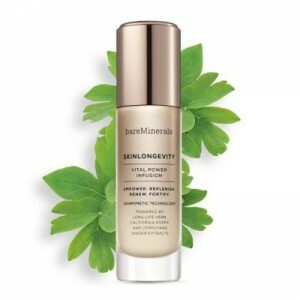 This patented formula uses the Long Life Herb found in Okinawa, Japan combined with California Poppy and Lempuyang to reawaken and help maintain your skin’s most vibrant look of health and reduce signs of aging. 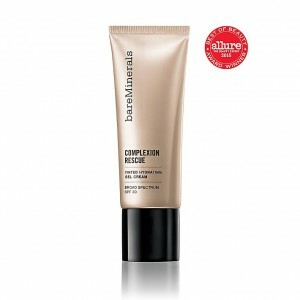 Complexion Rescue which is a BB, CC, Tinted Moisturizer Cream with 30 SPF Broad Spectrum. This is light and has some cover. It boats increasing moisture and hydration by over 260% after a couple of weeks of use. I like it because it is easy, light and good for my skin. It’s good to be a girl! When I was little, I was so glad I was born a girl because I didn’t want the pressure of taking care of a family financially and going to work everyday. I also didn’t think men had much fun with their awful selection of clothes. I mean pants or a suit with a shirt day after day…and then there was the hair, just cropped off. I think I would scream! Now I know times have changed and I actually have worked most of my life but not the 9 – 5 and I was blessed that my husband’s income has allowed me to pursue my passions whether they make much money or not. But let’s be honest, hair and clothes selections for men as well as shoes are so much more limited than a woman’s. I still am thrilled I get to be a girl! 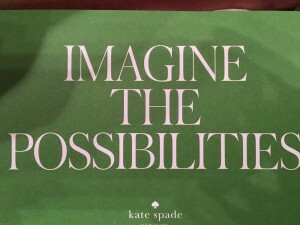 So Kate Spade makes me so happy about being a girl! Her delightful and feminine designs just sing pretty to me. 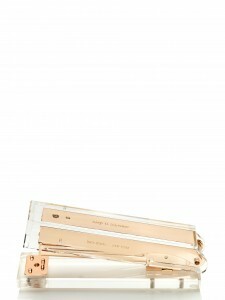 On my Rose Gold Renovation post, I highlighted her stapler. I liked it so much I ordered it. So the top pictures show how this beautiful stapler was delivered! Wrapped with care in the green and white striped tissue paper and the sticker and inside was the “imagine the possibilities” suitable for framing card…and I will ! Super impressed with this level of packaging. 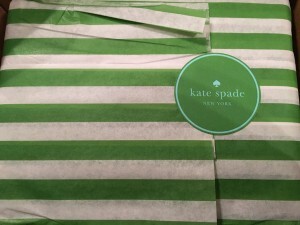 I just rewatched “The Intern” and it reminded me of her company and how important it was to her that items arrived in a properly wrapped presentation. Also shown here are some of my other favorites that I want to put on my wish list. 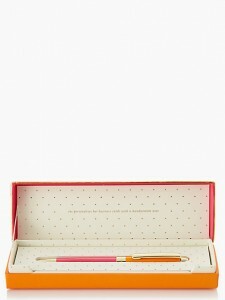 Everyone needs a great pen and there are other colors with other messages inside. I am partial to pink as you may know, so this is my pick. 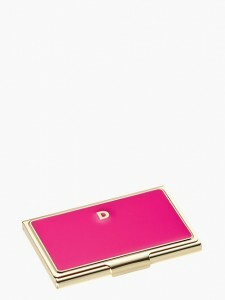 Also LOVE the business card case. 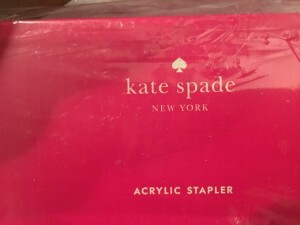 I featured a few of the many other desk accessories available from Kate Spade the Brand. She has home decor, wallets, kitchen, so many options…this is just one small part of the brand that at this time I am a little obsessed with. I recently met a friend of mine for dinner on “The Landing” which is a hot spot in Branson, MO that is sort of like a boardwalk along Lake Taneycomo which looks more like a river in this particular spot. We were eating at Cantina Laredo a wonderful gourmet mexican restaurant that is situated not just at the water’s edge but also next to the famous Fire, Water, Light and Music fountain that does a display every hour. I had no idea they carried glasses of any kind. So after dinner when we parted, I ran into Soma for some soft jammies that were on sale and as I was walking towards my car I passed the Brighton store and decided to check out these readers. I was impressed. It is hard to find much real fashion in readers and I have many because I lose them and they are fairly inexpensive. 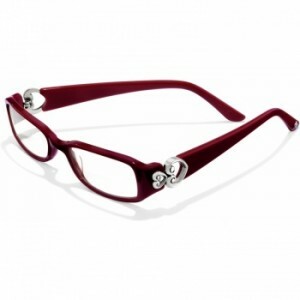 As I laid eyes on these mahogany red ones with silver cut out hears at the hindge I fell in love. I noted the price was much greater than what I typically paid and worried about losing them, but I determined that because I loved them so much I was sure to use them almost exclusively and would hold on to them for a long time. While there, I also could not help but see they also carried sunglasses. 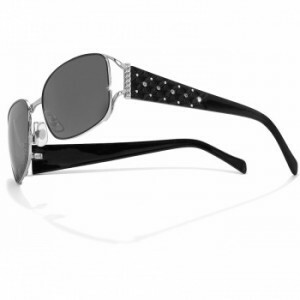 Like readers, I have more sunglasses than I can count often purchasing them at TJMaxx for $6.99 and that way I always have a pair in a car, a purse or drawer and back ups. They are cute no doubt. However, when I tried on the first pair that I was drawn to at the Brighton store, I noted something that reminded me of wearing snow goggles…super clear and clean vision with shade. I checked the prices and yes they were far more than $6.99, but again I spent more on my $6.99 glasses because I bought so many of them. I spent way more than one pair of Brighton sunglasses would cost. 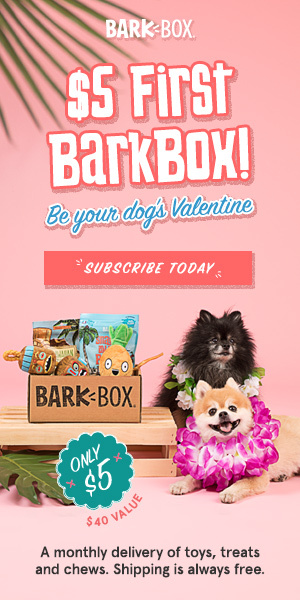 The cuteness factor was far greater and the vision satisfaction definitely sold me. My husband has expensive glasses, my kids have Raybands and other name brands, so now it was my turn and Brighton is not in the dollar league of many of the well known glasses so it was in my favor to purchase. We went on a ski trip this past month and I stopped by the sporting goods store to see if there was anything I might need. 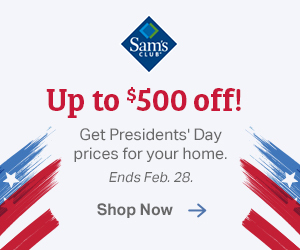 February is a great time to get deals on ski coats and ski wear. But I didn’t need that. I needed some tops to wear under my jacket, so I strolled through all of the ladies sportswear checking out the different displays. I saw some unique items on a table and was totally taken by this great on the go fruit infusion water bottle. The fruit goes in the lower segment and your water flows through both levels. 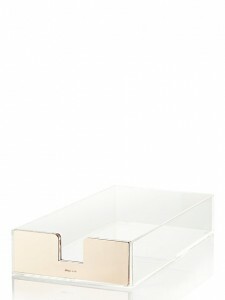 It is available in about 4 colors all with Rose Gold accents! I actually bought one in each color as gave them as a gift to my daughter, and sons’ fiance’ and girlfriend. I also purchased a large knit scarf/throw to use on the plane instead of a blanket, a pair of footies with tread, a pair of underwear and a gorgeous bag that I used as my carryon personal item. It is her color of the season which is in the red family but with purple, yet I would not call it burgundy…I just love the color and the zipper and all other metal components were Rose Gold. Remember, I told you it is a powerful trend that will make its way into our homes soon! The bag must not be available any longer so I won’t bother to picture it here, but I am sure she will have a new one for Spring or Summer or Fall and the details and functionality of it were superb! There is much in Calia’s sport line and I look forward to visiting the brand frequently for workout wear and accessories. Thank you for reading my Favorite 5 for March….Brands! I have to mention the first cologne…Rose Gold metal cap, Bareminerals has Rose Gold metal caps, Kate Spade Rose Gold and Calia items all had Rose Gold metal embellishments! Love it. I would love to hear your comments, especially if you love any of these great Brands. It is fun to share what we have bought and use…I am not a paid affiliate for any of these items at the time of this writing. If you enjoyed my article, please share on FB, Pinterest, Instagram and Twitter! If you don’t want to miss any of my future posts, please subscribe. What a great range of products Debbie! As I get older and now need glasses for reading I certainly need to invest in some pretty and cheap glasses for the car and different areas of the house as I have a tendency not to wear them all the time. Debbie, I could so relate about discovering bare minerals and then realizing i just couldn’t use it on my aging skin anymore! I am going to look into the liquid foundation and the face cream. My skin is so dry, it just screams for moisture. I too have experienced my moisturizer “rubbing” off my skin so it will be great to have a brand that absorbs. Btw, love all the rose gold accents!! Melony, They have a few more products in their skinsentials collection. 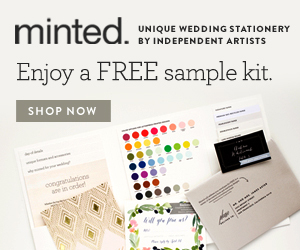 I know there are testers, but I wonder if they offer samples! Might be a way to give it a try. Great post Debbie! I love the fruit infusion water bottle – I will definitely be checking that out! 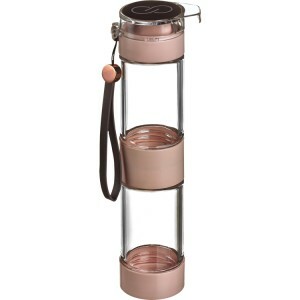 Thank you Debby, I gave one as a gift and she has it with her at work everyday for fruit infused water.